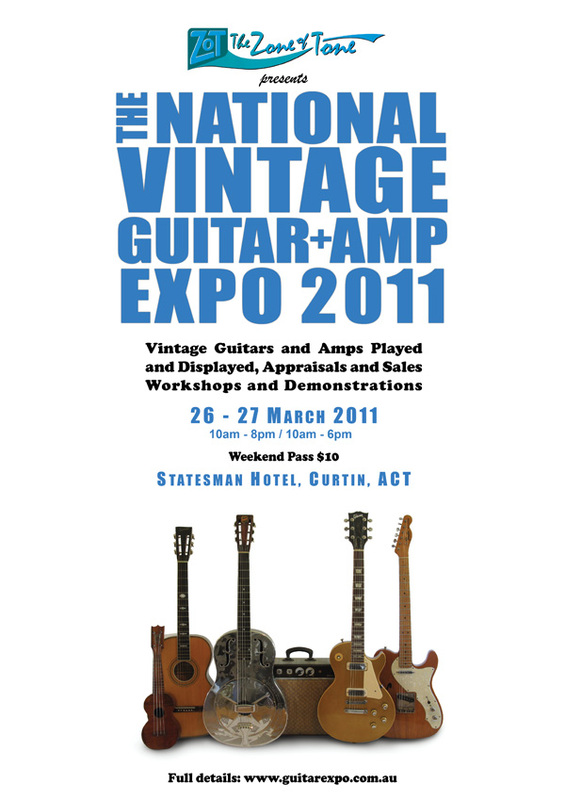 Classical Guitar Showcase & National Vintage Guitar and Amp Expo a great success! On Sunday 9 January, sildenafil Pierre Herrero showcased a dazzling array of wonderful classical guitars for the benefit of members of the Canberra Classical Guitar Society, guitar students and teachers as well as the general public at the Wesley Centre in Canberra. 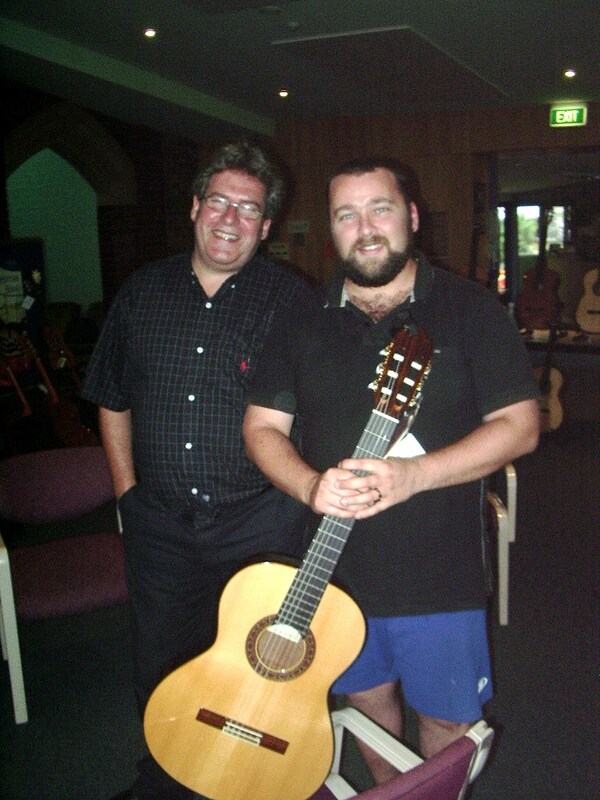 It was a last minute decision by Pierre to stop by on his way to the Sydney Guitar Summer School, so we didn’t get a chance to really promote this event. But Pierre has promised to come again this year and he says he’ll give more notice so we can get the word out. 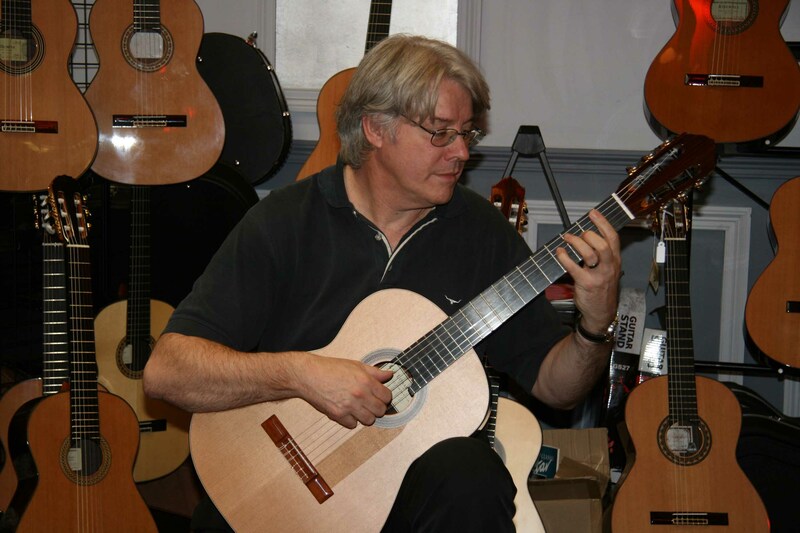 I thought I’d write this posting to give those who missed out an idea of what Pierre’s been up to and what sort of instruments he has currently available for sale. Pierre will be in Sydney for the Summer School until 16th January and then he’s going back to Melbourne. He will be coming back through Canberra. 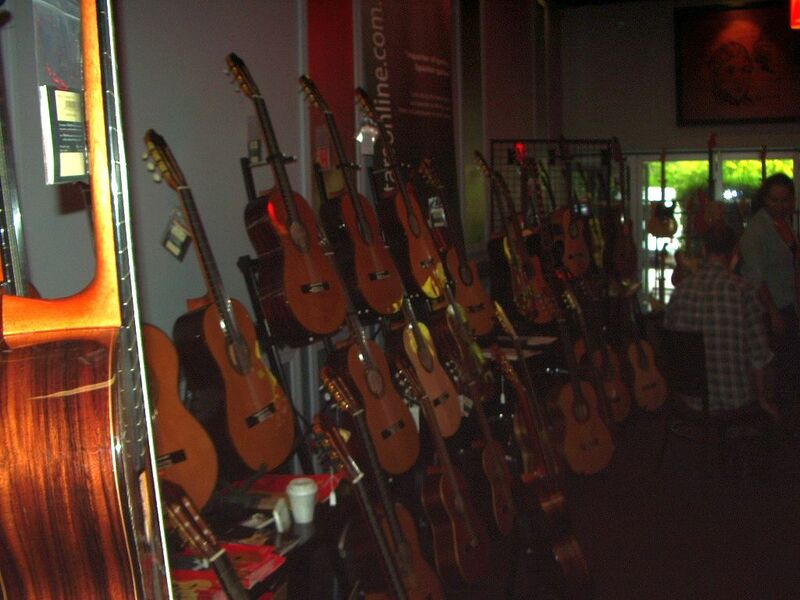 So, if you want to see any of these guitars on the way back he’ll be happy to make an appointment. He can be contacted on: 0410 708 338. I hope we all get to hear and see guitars of this quality again soon. Thank you Pierre. 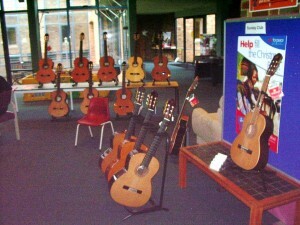 For our own part at Cooma School of Music, we try to stock on a regular basis the more popular guitars in the Alhambra student range. 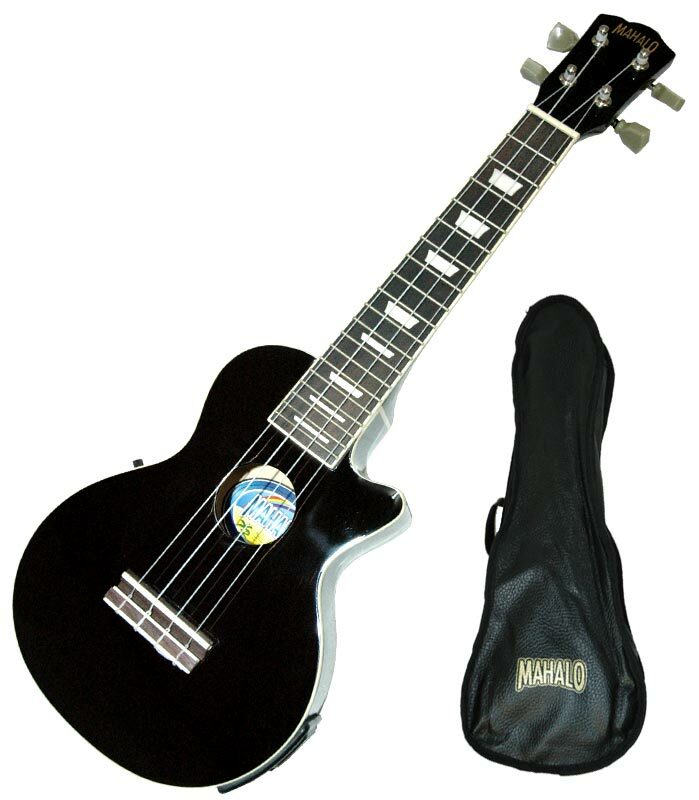 I feel at these prices, these Alhambra guitars represent outstanding value for their quality of sound, playability and workmanship. 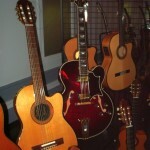 The Alhambra guitars in the student range are priced from $600 to about $1800. 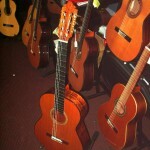 So keep a lookout and we’ll try and give people a couple of weeks notice before the next big Classical Guitar Showcase. 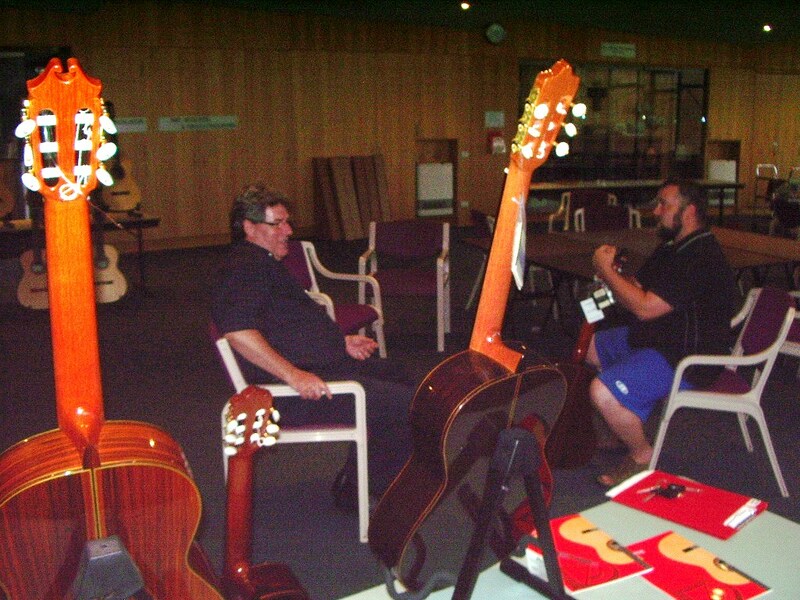 Patsy, did the 7 hour road trip all the way from Melbourne with his four-wheel drive packed with Australian and Spanish made guitars. What a selection! 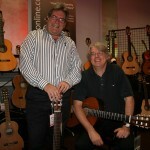 I hope we can do this again next year at the guitar expo. 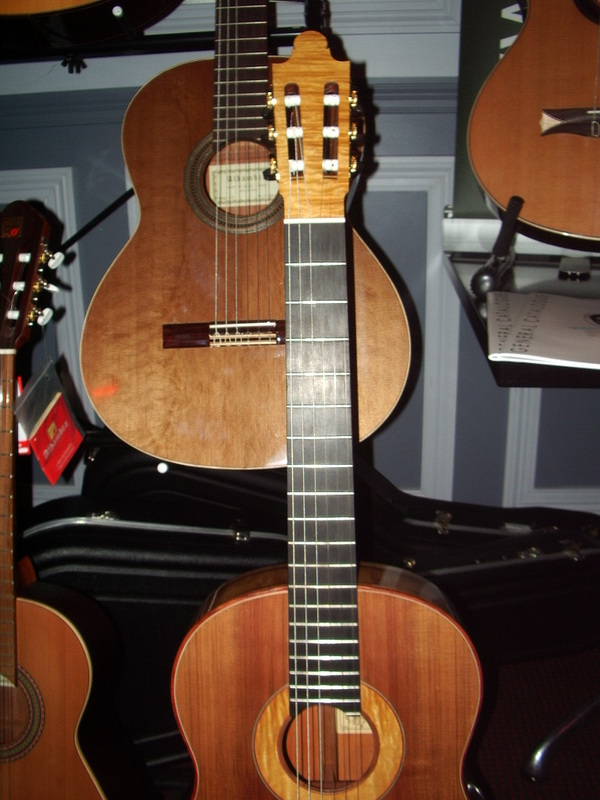 The people there, especially Ian Zot, were really helpful and welcoming, and there was a lot of interest in the fine classical and flamenco guitars we had on display. You can contact Pierre for more information either by phone +61 3 9395 5055, mobile 0410 708 338 or email pierre.herrero@telstra.com. This entry was posted in Concerts & Events on March 29, 2011 by allan. 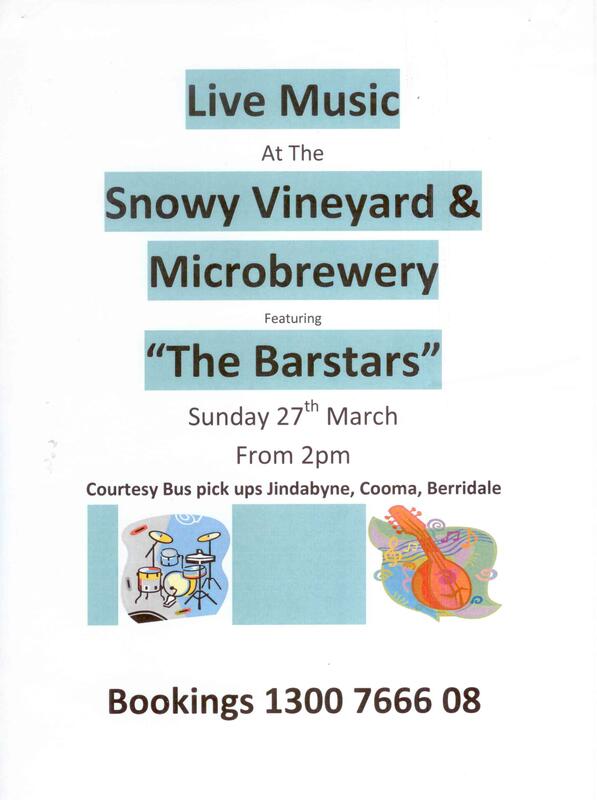 The Barstars will be performing at the Snowy Vineyard & Microbrewery this Sunday 27 March at 2 pm. Owen Moriarty and Jane Curry and the Guitar Orchestra led by John Couch. John Couch and the Duo Jackson. 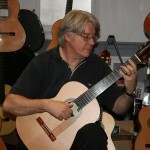 Lunch time concerts by Jane Curry, Cheryl Grice Watterson, Nick Price, Marek Pasieczny, Christopher Hill and Duo Tone. 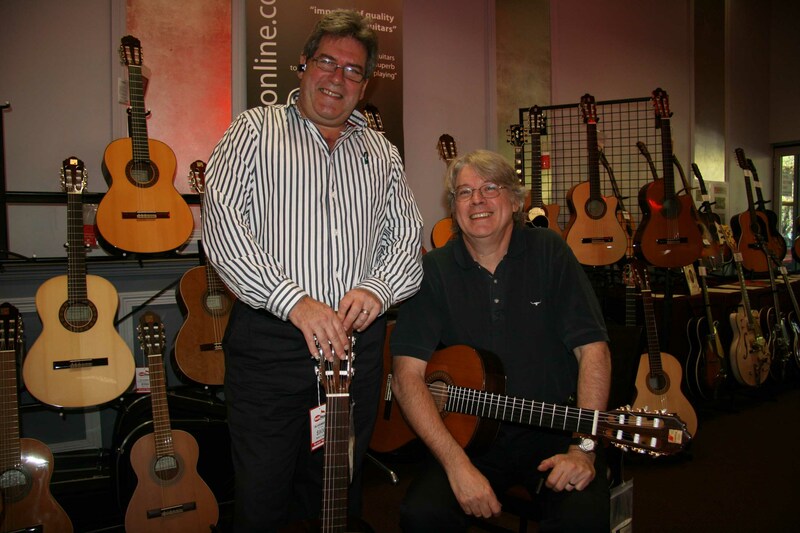 Master classes will be run by some of the most prominent New Zealand guitarists. 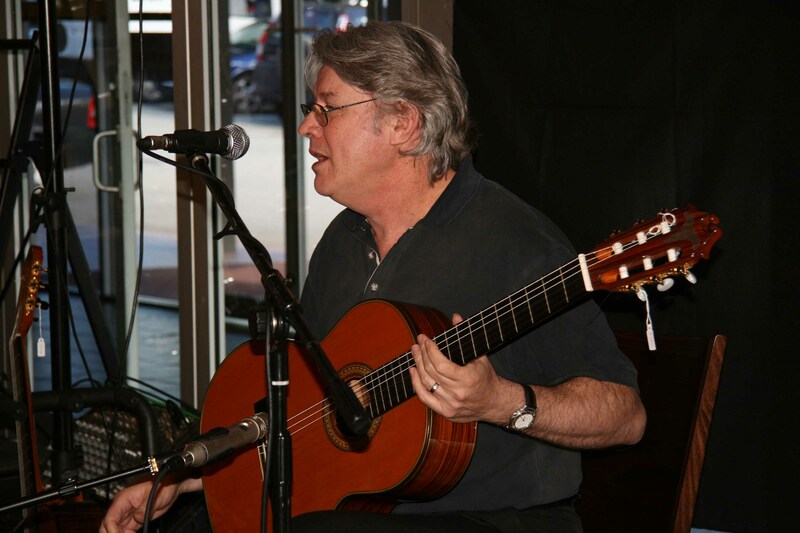 A whole series of talks will cover some of the elements encountered by guitarists from Flamenco Guitar techniques to Understanding Nerves and Conquering Stage Fright. 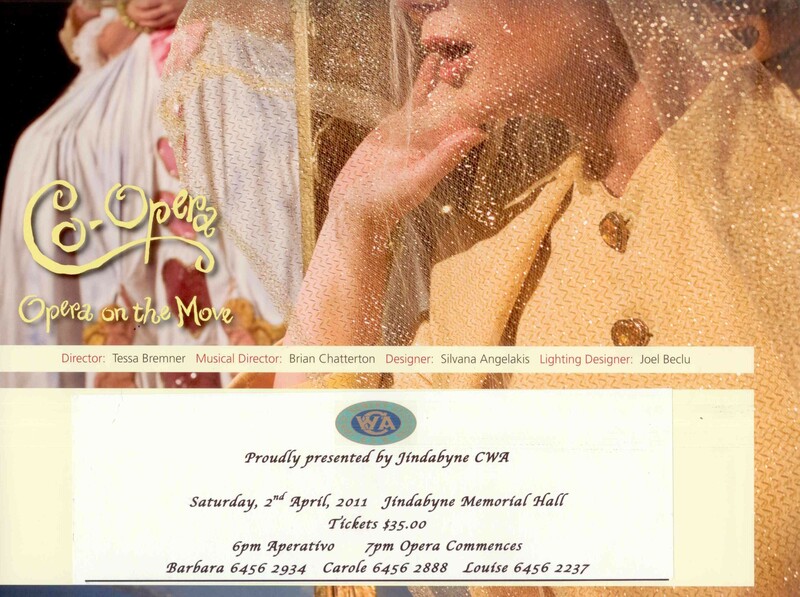 Would you mind if we were to send you some flyers/posters to place around in key areas to help us get the word out? I have your email address, what is your postal address please? 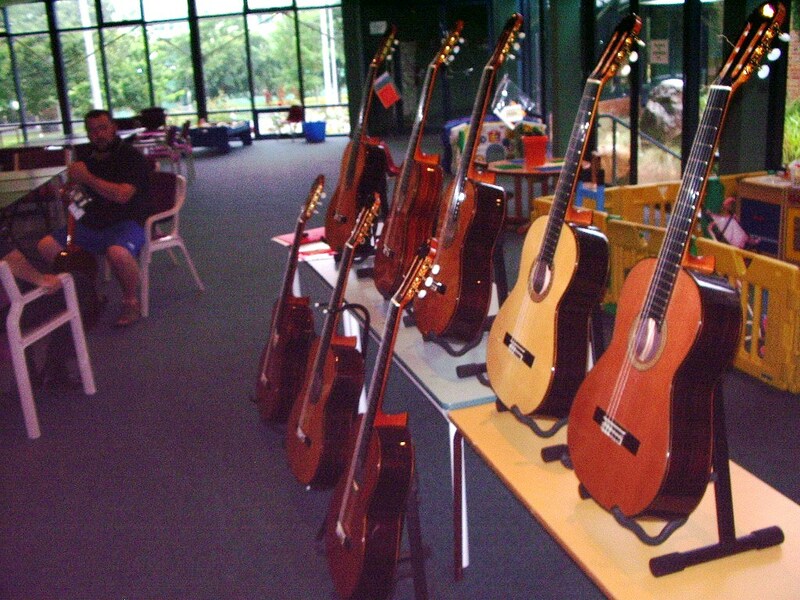 Registrations are open now; please forward this on to anyone and everyone you know that may be interested in coming to Taranaki for a week of guitar. For families traveling to New Zealand, Taranaki is a fantastic part of the country for tourists and travelers. This entry was posted in Music Festivals on March 28, 2011 by allan. This entry was posted in Concerts & Events on March 21, 2011 by allan. Come and enjoy a delicious afternoon tea in our “Music Café”. 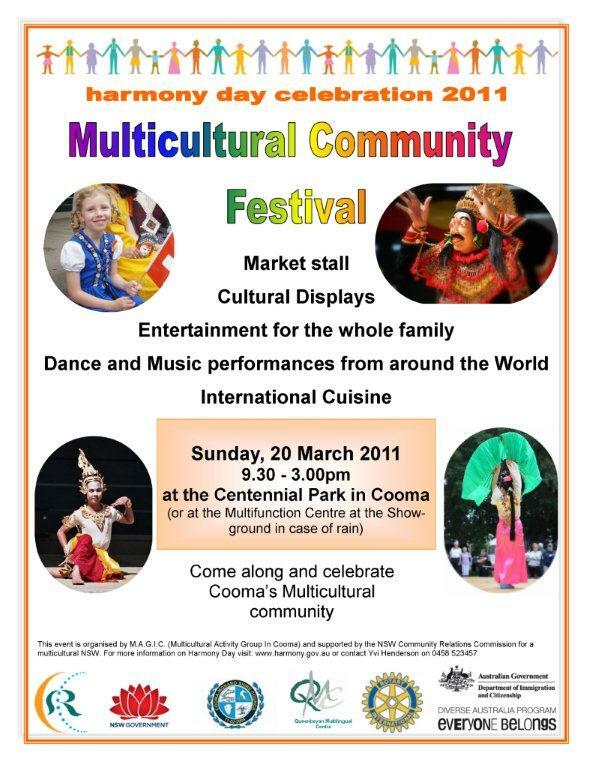 Live music will be provided by students & teachers of Cooma School of Music. The “Café Music” concept is a variation on the theme of “student concert”. We decided to “play” this in the “key of relaxed”. The audience is seated at tables around the hall. They can listen to the music, store read the Saturday papers, play a game of chess, cards, snakes and ladders, have a conversation, enjoy a leisurely afternoon tea with bottomless cups of tea or coffee. 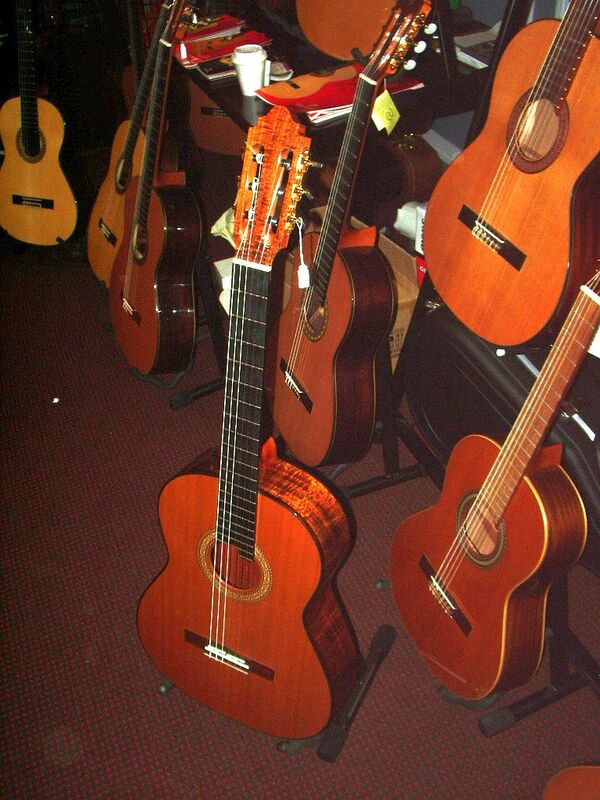 The music students will perform in a more relaxed atmosphere. The café opens at 3pm, Saturday 9 April at St Paul’s Anglican Church Hall, 138 Commissioner Street. Please bring a plate of festive food to share and some games to play. Tea & coffee will be provided free. play a game of chess, cards, snakes and ladders, have a conversation, enjoy a leisurely afternoon tea with bottomless cups of tea or coffee. The music students will perform in a more relaxed atmosphere. read the Saturday papers, play a game of chess, cards, snakes and ladders, have a conversation, enjoy a leisurely afternoon tea with bottomless cups of tea or coffee. 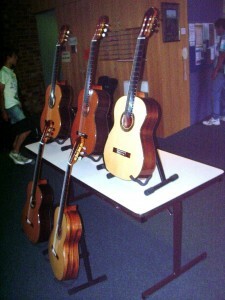 The music students will perform in a more relaxed atmosphere. 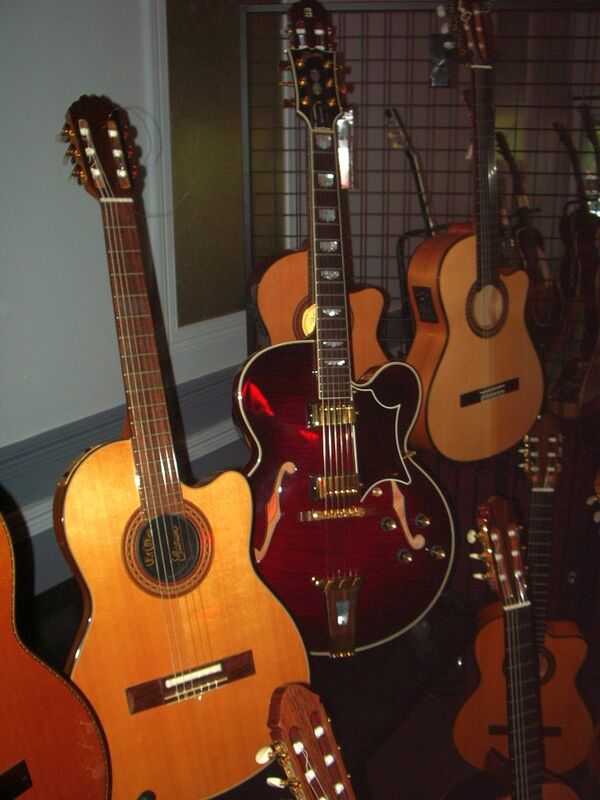 Pierre Herrero, Spanish Guitar Imports, will showcase some of his more than 350 guitars at the National Vintage Guitar & Amp Expo. The best part is, you can ask him to bring the ones you want to try. He’ll be at The Statesman Hotel, corner Strangways and Theodore Streets, Curtin ACT 2605. 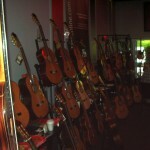 A partial list of the guitars can be found online at http://guitarsonline.com.au/jma/. 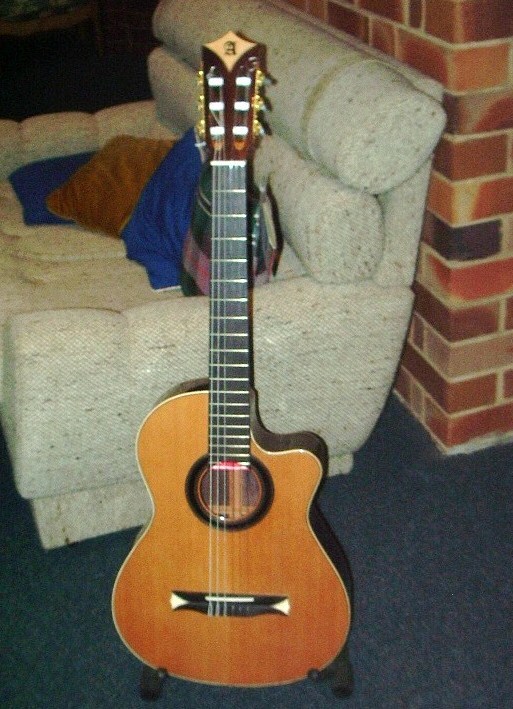 In addition, Pierre has guitars from Australian makers Dan Kellaway, Allan Bull, Kim Lissarague, Lance Litchfield, John Price and Graham Caldersmith. 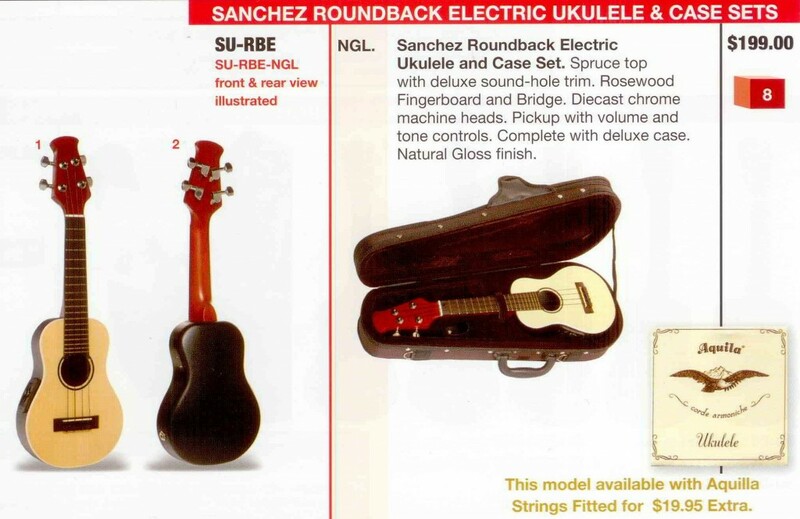 Contact Pierre for a complete list of guitars available either by phone +61 3 9395 5055, mobile 0410 708 338 or email pierre.herrero@telstra.com. 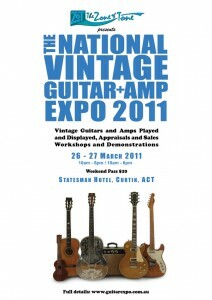 Pierre is offering FREE tickets to this fabulous Guitar Expo. Just email him and Pierre will send you a personalised pass to the Expo. Where: The Statesman Hotel, corner Strangways and Theodore Streets, Curtin ACT 2605. This entry was posted in Concerts & Events on March 14, 2011 by allan. 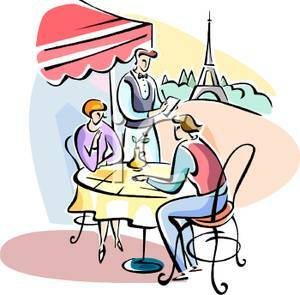 cards, snakes and ladders, have a conversation, enjoy a leisurely afternoon tea with bottomless cups of tea or coffee. 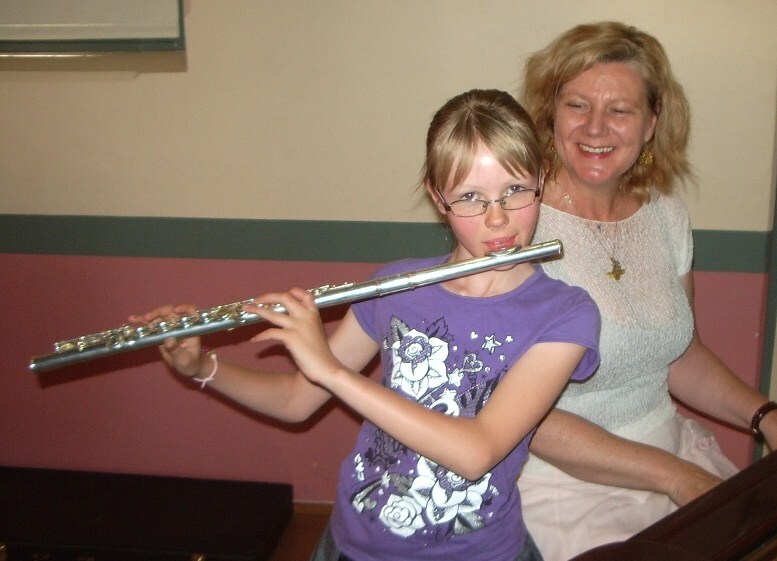 The music students will perform in a more relaxed atmosphere. The audience is not expected to stay for the whole afternoon. They can come and go as they please. Please bring a plate of food to share and some games to play. Tea & coffee will be provided free. This entry was posted in Concerts & Events on March 13, 2011 by allan. 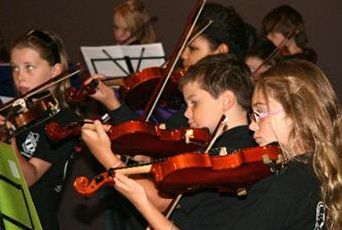 Snowy String Community Orchestra is looking for members. 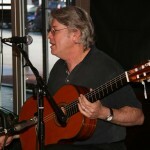 The flute and guitar concert was a real treat last Saturday. Such expressive playing! 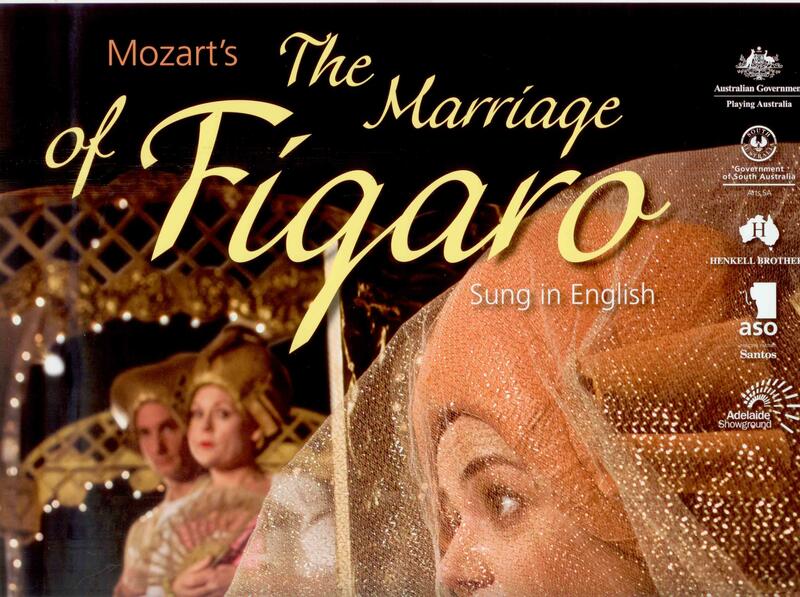 I’m looking forward to the new CD. 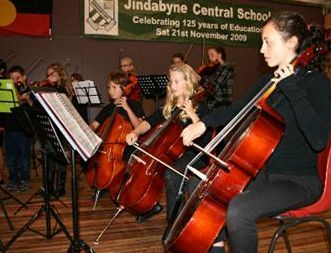 located at Jindabyne is looking for a pianist and a double bass player. Interested members would need to be able to attend Thursday afternoon rehearsals between 3 15 and 5 pm at Jindabyne Central School and also a full day rehearsal once a term on a weekend. Also playing a various community events is a further commitment that would need to be made. there would be no payment for your involvement except the joy and fun of working with a group of children who are highly motivated. We have 4 cellos, 2 violas and 20 violins at present with many beginners waiting in the wings. 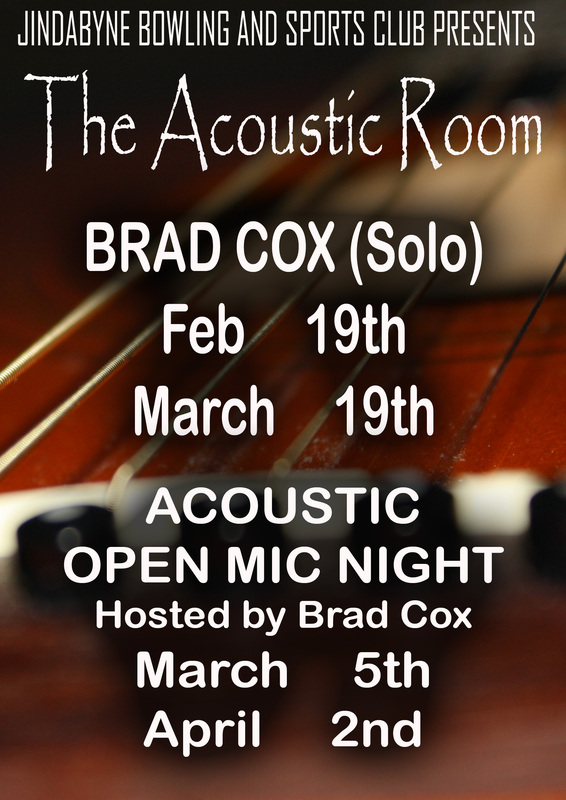 Also if you know of any other string players in the area who would like to be involved please let me know. We are more than happy to welcome players from outer areas into the orchestra so long as they can make the commitment to attend rehearsals. The Snowy String Community Orchestra is in the process of planning a skills-development tour to Brisbane in October of 2011 and have just hosted the Paderewski Orchestra from Chicago with a view to a Chicago in December of 2013. 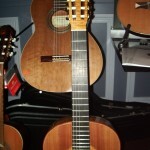 This entry was posted in SCS Orchestra on March 8, 2011 by allan. 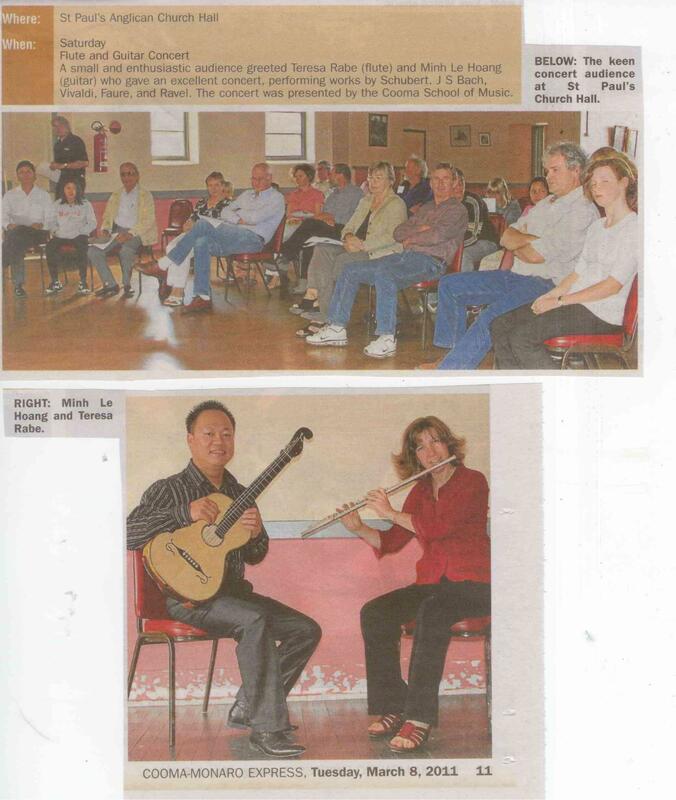 Minh Le Hoang & Teresa Rabe Concert a Great Success! This entry was posted in Concerts & Events on March 8, 2011 by allan.